When I ask Eric Lebersfeld, president of Capitol Lighting, how long he has worked in the family business, he replies: “Fifty years.” The answer reflects his wry sense of humor. He is 50 years old. Capitol Lighting recently opened its first Broward County showroom in Fort Lauderdale, its first all-LED showrooms illuminated with 5,000 energy-efficient LED bulbs. City & Shore: What special services do you offer? Eric Lebersfeld: Clients can get lighting anywhere, but it isn’t just the lighting. Our consultants know the products inside and out. They know the mistakes. It would be a disservice if we didn’t ask the right questions. What is the size of the room, size of the table and height of the ceiling? Is it just for dining or homework as well? We find the right control for the right fixture and help them find the right fixture on our website. We also have price guarantees. C&S: What are the latest lighting trends? EL: LEDs allow creation of fixtures that were never done before, such as lighting that resembles beautiful sculptures. They are trending more contemporary. There is a large use of chromes and golds. It used to be polished brass. Now it is more bronze and gold, but it is still dominated by chrome and white. Rose gold is on the rise. C&S: How important are big names like Allison Paladino and Vanilla Ice in attracting customers, or is it just the design they go for? EL: It depends on the customer. 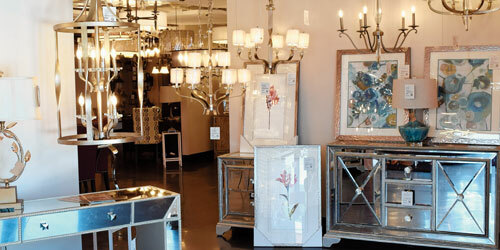 Designers are educated, they read magazines and know names like Fine Art Lamps, which makes the Paladino designs. The average customer counts on us to educate them. Ultimately the customers choose based on the style, not the brand name. C&S: Tell me about your charity support for Habitat for Humanity. EL: I am on the board for Habitat South Palm Beach. We donate all our fixtures if we need the space for new fixtures. Last year we donated $160,000 worth of fixtures. C&S: What was your most rewarding charitable gift? EL: One of our New Jersey employees needed a van with a lift for his son who has muscular dystrophy. He started a Go Fund Me page on Facebook and wasn’t getting enough money. There is a program to help, but he had to raise $20,000. We made the largest single contribution of $5,000. A customer saw a sign in our Paramus store and she matched our donation. It was one of the most rewarding things in my business career. C&S: What is your mantra? EL: Making lives brighter. We take it very seriously on several levels. It is more than selling a lighting fixture. We want to make their home a sanctuary. And we make employee lives brighter. They tell us what charities they are evolved in, and we support them.